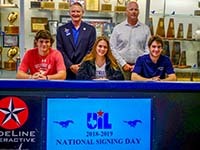 Friendswood High School's three college athletic scholarship recipients celebrated signing their national letters-of-intent. They are (seated l-r) William North (Chestnut Hill College - lacrosse), Faith Brothers (St. Edwards University - cross country), and Parker O'Leary (Elmhurst College - lacrosse). FRIENDSWOOD — Friendswood High School's three college athletic scholarship recipients celebrated signing their national letters-of-intent.